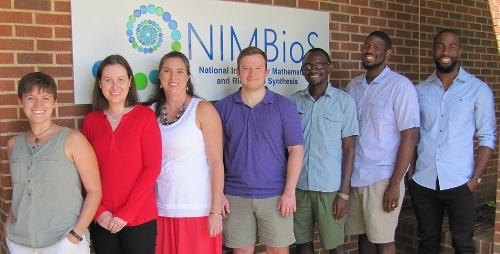 NIMBioS provides opportunities for postdoctoral scholarship at the interface between mathematics and biological science. Since 2009 when the program was established, NIMBioS has supported 48 postdoctoral fellows for two-year fellowships. The NIMBioS Postdoctoral Fellowship program is top-of-the-line, designed to help Fellows succeed in future endeavors, whether as a faculty member at a R1 institution or liberal arts college, a position in government, or conducting research in industry. More than 85% of NIMBioS postdoctoral fellows accept faculty positions at the world's top institutions (Top 500, Shanghai Rankings), a far higher success rate than most postdoctoral programs. Through their NIMBioS fellowship, postdocs have produced 193 journal papers, 162 presentations or posters, and three book chapters. Applications are currently being accepted for a Targeted NIMBioS Postdoctoral Fellowships in Mathematical Modeling of Biological Systems. "This is probably the best postdoctoral experience I have had. I enjoyed working with colleagues as well as sharing the experience of my mentors in terms of career planning, job search and interview. One of the great things about NIMBioS postdoc experience is the opportunity to learn how to communicate your research to others, and having camera time talking about your research. Overall, I felt like NIMBioS was trying hard to improve the chances of its postdoc to get jobs and pursue their career." "Working at NIMBioS was very much like having a junior faculty position. I had mentors I could consult, but the decisions about what research to conduct and how to do it were mine alone…this was excellent preparation for a 'real' faculty position." "If I had to do it all over again, I would be a NIMBioS postdoc again without hesitation." Read about our postdoctoral fellows. Get the full details about the NIMBioS Postdoctoral Fellowship program. Visit our blog for news about our postdocs. If you are interested in applying for a Targeted NIMBioS Postdoctoral Fellowship click here.